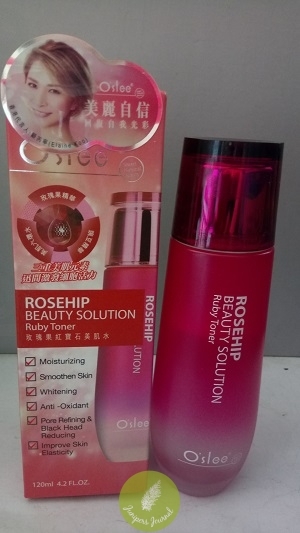 When the weather is as hot as it is now, all I want is something refreshing on my face after I have removed my make-up and O’slee Rosehip Beauty Solution Ruby Toner is certainly quite refreshing. This one is called “ruby toner” because it contains clustered water which is known as the “ruby of water”. Benefits include improved skin elasticity, hydration, collagen growth, stimulating self-repairing ability of stem cells & reducing appearance of wrinkles. I can say that the scent is very nice, it improves skin hydration and softens skin. Can either be applied with a cotton pad or poured into the palm. Might be better to apply with palms as you might use more if poured on to a cotton pad.